Alexander 11 was the Emperor of Russia from 1855 – 81. His great achievement was the Emancipation of the Serfs and his reign saw the most challenging reforms undertaken in Russia since the reign of Peter the Great. Before he came to the throne the atmosphere in Russia was unfavourable to any kind of change, freedom of thought and all forms of private initiative were being suppressed vigorously and criticism of the authorities was regarded as a serious offence. The emancipation contained very complicated problems, deeply affecting the economic, social and political future of the nation. By the end of his reign, the serfs were transformed into a class of independent communal proprietors. Alexander was strong enough to push through his reforms against the pressures of tradition, he was known as Alexander the Liberator. Alexander’s chart shows him to be a natural ruler. He had the Sun in Taurus in the 10th house of career and high social standing. Taurus is the most stable and determined of all signs. Taureans are known for sticking to their principles whatever the opposition or circumstances. He also has Leo rising which gives him natural leadership ability and enhances his power and stamina. This combination on its own would indicate a powerful monarch but one who is likely to be a conservative traditionalist. Alexander’s Moon however is in Aquarius, which gives him a instinctive feel for the needs of the common people and a desire to improve their conditions and instil some greater measure of equality to their lives. In the astrological world there has been much debate about whether Uranus, Neptune and Pluto could affect individuals before they were discovered. Capricorn Research has found many instances of important people being profoundly affected by these planets particularly if their lives had a major impact on the future. Alexander 11 would certainly come into this category and Pluto’s transits stood over his life with remarkable simplicity. The 3 most important points in any chart are the Sun, Moon and Ascendant. In most cases Pluto will only make one aspect to each of these in a lifetime. Pluto’s first aspect was in square to his Leo Ascendant in 1855, this was most appropriate because he was crowned under this transit, he first took on the appearance ( Ascendant ) of being emperor ( Leo ). The second one was the conjunction to the Sun in 1861 when he oversaw the Emancipation of the Serfs. 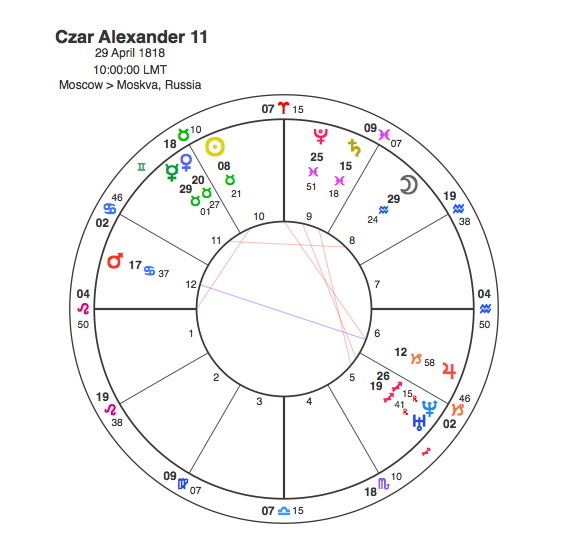 This is by far the most important transit as its a conjunction and its to his Sun, it marked a watershed for Alexander but also for the Russian people. The third one was in 1881, a square aspect to his Moon. He was assassinated under this influence and its interesting to note that the Moon is in the 8th house of death. So Pluto’s only 3 transits of his lifetime marked his coronation, his peak achievement and raison d’être and his demise. Not bad for a planet that wouldn’t be discovered for 50 years.